All male puppies from Jack and Flare’s 2011 Litter. These red nose pups are 5 weeks old in this video. Hopefully this will give everyone an idea of what their personalities are like and make it easier to pick out their puppy. Ginger is in heat and expected to breed to Jack around January 24th 2011. Firefly went into heat later than expected so we bumped her breeding up one month, so we now expect to breed her to Bullseye around April of 2011 instead of March. I am putting new pictures up of Bullseye, Dixie and Firefly right now. So be sure to check ’em out! Dixie went into heat on 1/23/11. We expect to breed her to Bullseye around the 1st week of February. Update: Ginger was bred to Jack and Dixie was bred to Bullseye. 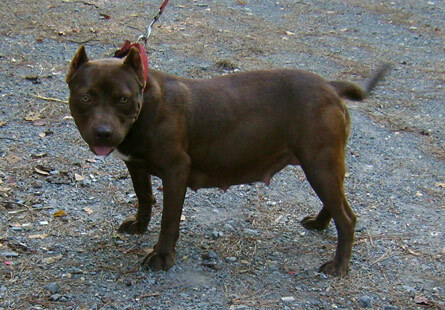 Both litters are expected at the end of March and beginning of April 2011. Please see our breedings page for details on these breedings: http://www.bryantsreddevils.com/Breedings.htm . Bittersweet is due to have her puppies in just a few weeks, this is her with her big new belly! Update: Bittersweet had a very hard labor where a puppy got stuck inside her birth canal. It was far enough up in her that I could not reach it to pull it out. I rushed her to the emergency vet in the middle of the night so that we could get her some help, bad news is that nearest emergency vet was 45 minutes away… By the time we got to the vet and admitted her, too much time had passed to save the babies. I decided to have Bittersweet spayed while she was getting her c-section done, because I did not want to risk having complications again. This was her first breeding so there was no way of knowing that this was going to happen. She saved my life last year when a strange man followed me into the woods while we were on a hike, I am not about to risk hers for puppies. We breed these dogs because we feel they are contributing to the breed, NOT for profit. It was a very easy decision for us to make and we will continue to love her as always. You are currently browsing the archives for the Puppy Updates category.